Three people of Chipulukusu township in Ndola have been seriously injured after a Toyota Hiace minibus they were travelling in collided with a locomotive train at a railway crossing. The victims have been identified as Donald Sompanje, 2, who sustained a fractured right leg, Idah Mtonga, 10, who sustained a cut on the right ear and Emeldah Simpanje, 17, who sustained a fractured left arm. Police Spokesperson Esther Katongo confirmed the development, saying the accident happened today around 10:00hrs in Ndola along Moffat road at a railway crossing. “There was a serious road traffic accident which occurred today 22nd July, 2018 at 1000 hours in Ndola along Moffat road at a railway crossing involving a Toyota Hiace minibus registration number ACV 3444 which was being driven by George Kamanga aged 30 of unknown house number who sustained cut on forehead and had general body pains,” Katongo said in a statement. “On board were pasengers namely Donald Sompanje aged two years who sustained a fractured right leg, Idah Mtonga aged 10 years who sustained a cut on the right ear and Emeldah Simpanje aged 17 who sustained a fractured left arm, all are of Chipulukusu. 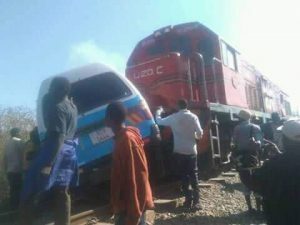 Katongo explained that the accident happened when the driver of the motor vehicle moving from south to north failed to give way to the locomotive which was moving from west to east. She said he injured are in Ndola Central Hospital.